Made with solid brass hardware and triple-ply premium nylon webbing. Rolled throat for better fit and comfort. 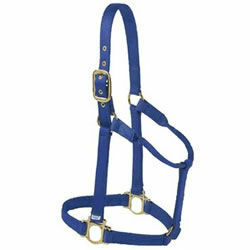 B Halter is available with throat snap and adjustable chin. Sizes: Pony fits 100 to 200 lbs, Colt fits 200 to 300 lbs, Yearling fits 300 to 500 lbs, Small Horse fits 500 to 800 lbs, Medium Horse fits 800 to 1,100 lbs, Large Horse fits 1,100 to 1,500 lbs, and Draft Horse fits 1,500 to 2,000 lbs.